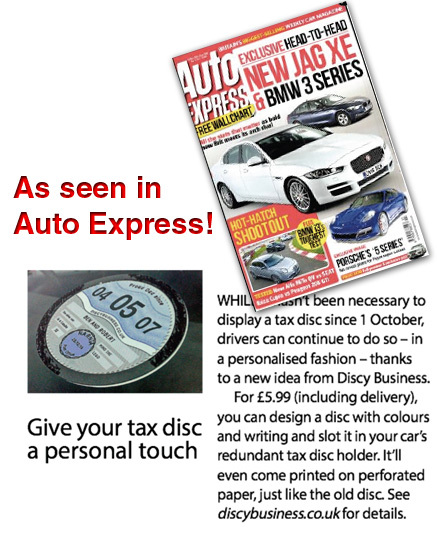 Since October 1st, UK car owners no longer receive a tax disc for paying their car tax. That doesn't mean your tax disc holder has to go to waste though! Here at Discy Business, you can create your very own customised disc and have it sent out next-day. It's the best motoring related novelty gift of 2019 by far! We accept all major credit cards with or without a Paypal account. If you have any questions please call 020 718 33 494 during UK office hours. Suggestions? Website broken? Think we're awesome? Contact us. Yes, our discs are street legal if used appropriately. So feel free to buy lots of them.. just don't block the driver's view!